Not only are there heartfelt prayers in this short eBook by the great biblical exegete John Calvin, but deep insights into the nature and character of God. This is a worthwhile book to read & pray through as you have Scripture open beside you! This FREE offer is only available until 10/19. 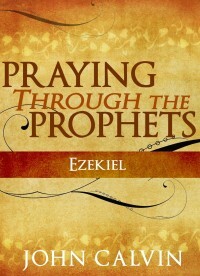 Praying Through the Prophets (Ezekiel) is a compilation of prayers taken from John Calvin’s commentaries on the Old Testament prophets. Each prayer has a scripture that can be read alongside, deepening your love and understanding for the Word. There is nothing so fulfilling as praying to God with a Bible open on your lap ready to listen and hear from Him. Use these prayers as a springboard into your own prayer life. As you pray you will find yourself thinking of other things to pray about resulting in drawing close once again to your Savior. Putting God first and removing any idols that are taking His place will result in a wonderfully fulfilling relationship with the Lord, and which will have an impact on all around you.